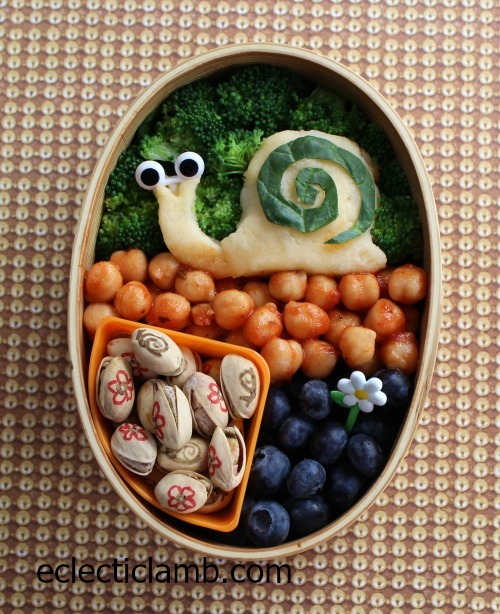 I had fun making and eating this Happy Snail lunch. The snail is mashed potato with these eye picks and spinach details. I used a cookie cutter from the Ikea Woodland set to make the snail shape. Since I don’t like nori, I used spinach instead to detail the snail’s shell. As usual, I enjoyed drawing on pistachio shells. Container: Wooden box purchased in Kyoto at Bento&co. A fun lunch!!! I love the snail and the layers of textures. So adorable! I love how you decorated the nuts!